Once known as the fruit of kings because they were only available to natives of the tropics and wealthy Europeans, pineapples are now a popular exotic fruit in the U.S. Our pineapples are super sweet and exceptionally flavorful, perfect for adding bold flavor to any dish. They are tender enough that you can peel, slice, and enjoy the whole fruit. 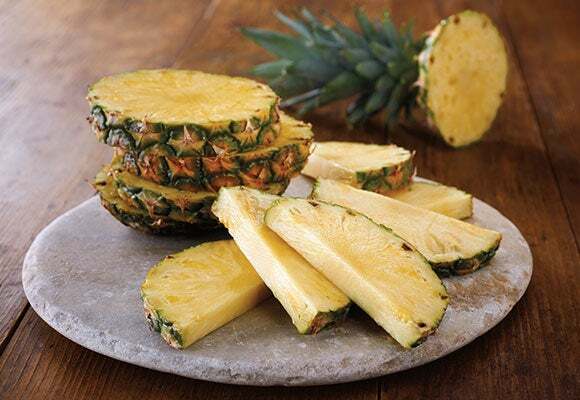 Pineapples contain a natural tenderizing enzyme that makes them ideal for pairing with meat and poultry. Baking, grilling, and roasting pineapples brings out the sweetness and mellows the acidity, making them highly versatile. Our peach and pear trees are now in bloom! The frost teams remain on high alert, ready to do everything they can to protect the delicate blossoms in case the temperatures drop too low. Our apiarists have moved beehives into the orchards so the bees can begin their work of pollinating the flowers. 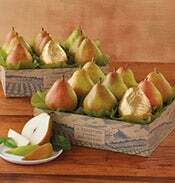 We are currently shipping Comice pears grown in Chile. During the month of April we will ship Navel oranges and Gold Nugget Mandarin oranges grown in California. We are currently shipping Smitten and Jazz apples grown in Washington, as well as Empire apples grown in New York. How do your orchardists ensure your pears are all ripe when they arrive, even when the weather is different from year to year? 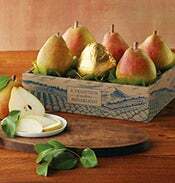 Because pears require cold weather to become sweet, our orchardists pick each pear the moment it ripens, after which we place them in cold storage for up to 30 days. This ensures that every pear in your box will arrive within a day or two of being ready to eat. How do you get great pears all year round? We work with growers in multiple parts of the world to ensure that we have access to the right climate to grow top-quality Comice pears all year. Our orchardists fly out to Chile and New Zealand to inspect the pears we select, and we fly orchardists from those countries here to train them so they can provide pears that meet our standards. When does your pear crop ripen? Depending on the year, our pears can ripen anywhere from the second week of August to mid-September. The cooler the growing season is, the faster our pears ripen. When does your peach crop ripen? Our peaches ripen from the beginning of July into August while the weather’s warm. Unlike pears, peaches ripen faster in warm weather. If we get a cooler fall season, this means the peach crop and pear harvest will sometimes run together. How do you make sure the best fruit gets into your gifts? Every peach and pear (the two fruits we grow in our own orchards) is picked by hand sorted in the field. We then use a machine to take 17 pictures and sort them again to weed out imperfections, and finally, before packing, each piece of fruit is looked at one more time, by hand, to ensure only the highest-quality fruit is shipped. How much fruit do you grow each year? We grow about 400 tons of Oregold® Peaches, 15,500 tons of Royal Riviera® Pears, and 800 tons of Bosc pears. The total harvest varies based on weather conditions throughout the year. Where do you grow your apples? The majority of the apples we sell come from quality growers in Washington, since Washington apples are high quality and can be shipped everywhere in the U.S. From March to July, when apples aren’t in season there, we send our orchardists and merchants to New Zealand, which shares similar climate characteristics to the U.S. Pacific Northwest in many areas. What’s a fun fact about a fruit that most people don’t know? In order to turn orange, citrus fruit needs the cold. When temperatures are too warm at night, oranges, HoneyBells, and other fruit will stay green—even though they’re perfectly sweet and delicious. They just don’t take on that beautiful orange hue. This light and tropical green smoothie is the perfect spring snack and makes for a great breakfast alternative. This sweet treat is the perfect burst of summer flavor for gray winter days.